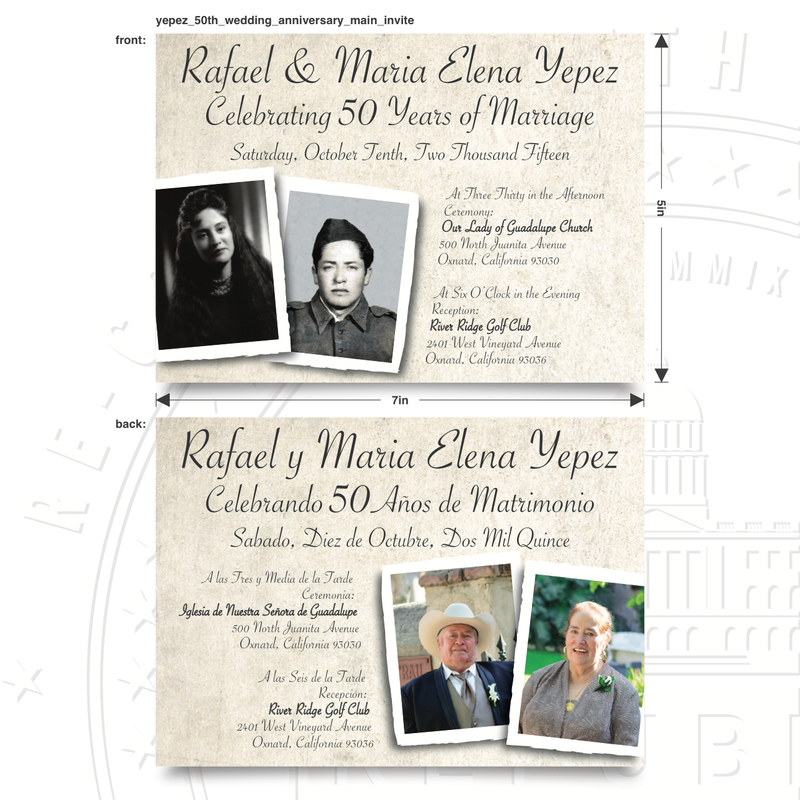 “Mi Familia” commissioned Republic Design Company for the design and production of Rafael &/y Maria Elena(‘s) Yepez 50th Wedding Anniversary Invitations. 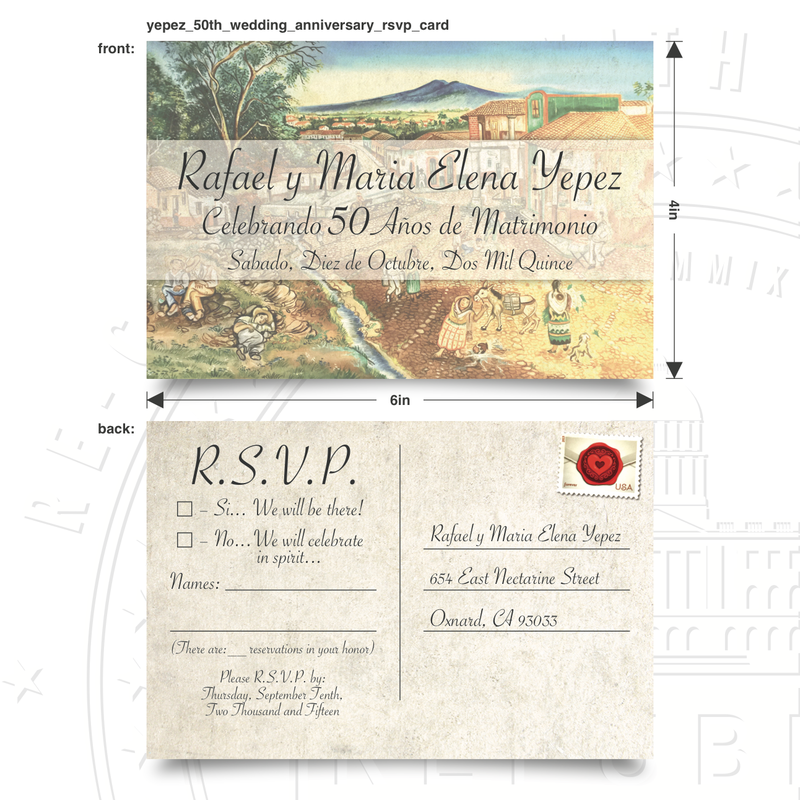 The invites had to be in both English and Spanish for the convenience of perspective invitees. 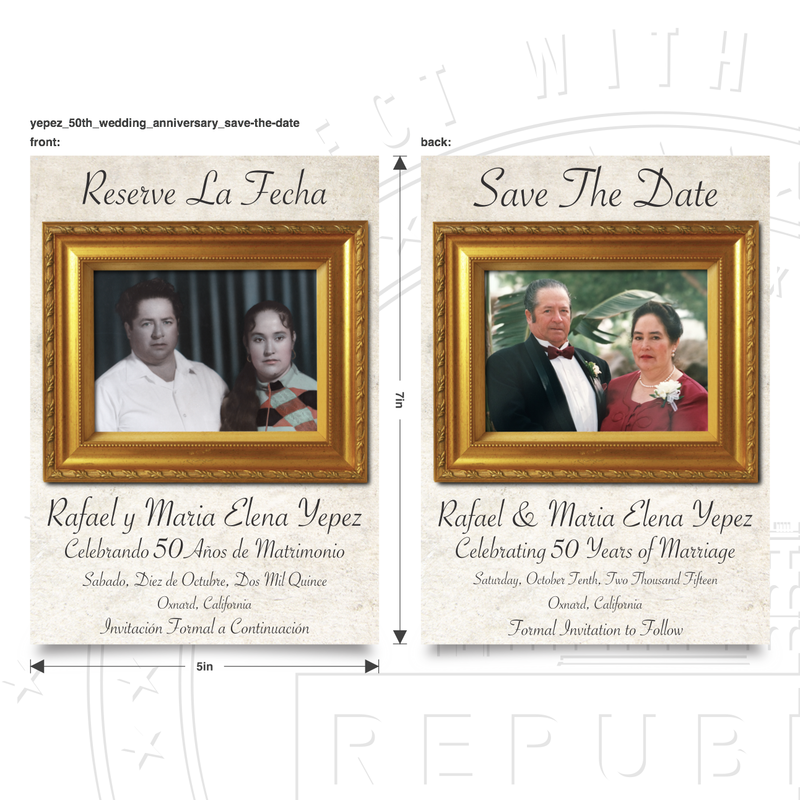 First, we created the “Save-The-Dates.” On the Spanish side, we included a picture of one of their original wedding photo’s from 1965, as they were originally married in Mexico. The English side contains a slightly more recent photo of them. Both photo’s are adorned with a fancy gold frame as the color gold is thee customary color theme for a 50th wedding anniversary. 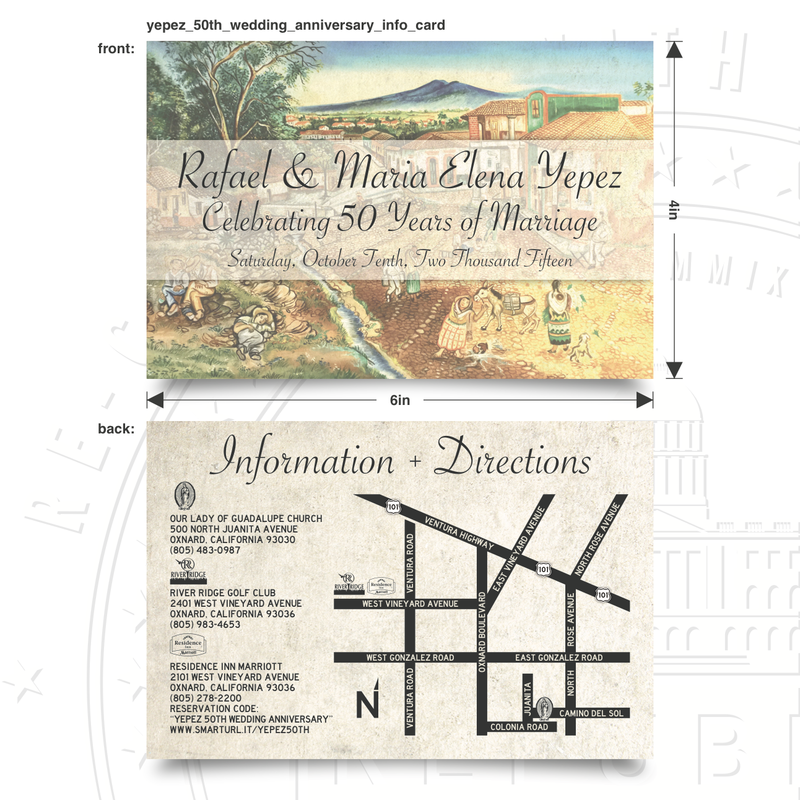 Next, we created the main 50th wedding anniversary invite. Again, the Spanish side contains pre-wedding photo’s; English side – more recent. 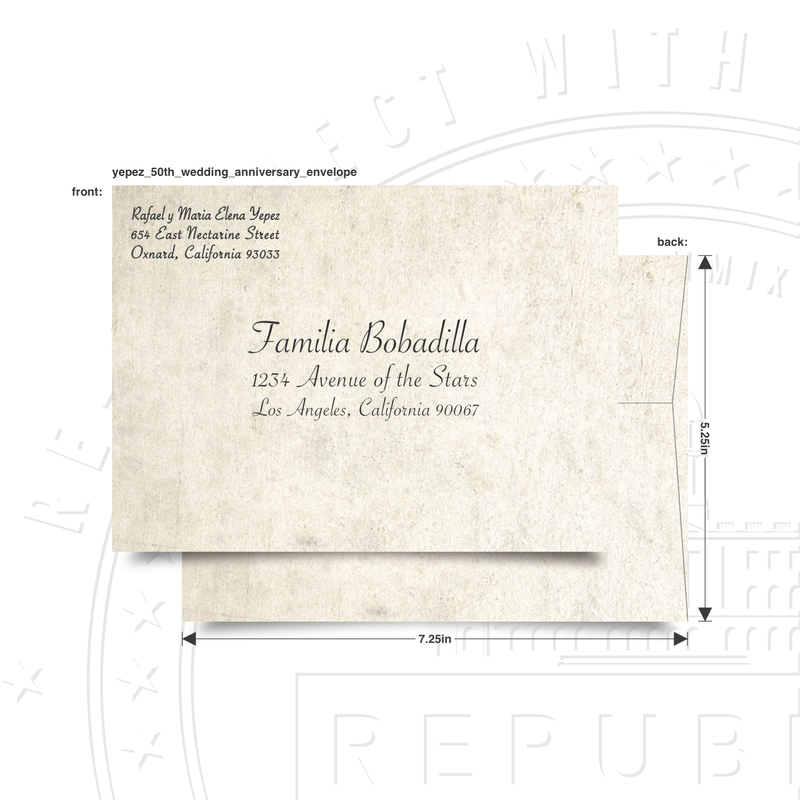 The RSVP cards are actually postcards specifically designed for invitees to mail-back to a specific address; fully-equipped with postage and return address. Special note, the “scenic background/backdrop/painting ,”of front side of RSVP and Info card is a hand-painted rendering (artist unknown) of the city of Churintzio, Michoacan, Mexico, where both are originally from. We also designed a information card that has a map of critical locations, times, and contact numbers. Main invite, RSVP card, and info card were enclosed in a A7 (5.25in x 7.25in) envelope. We custom printed each address (with return address) on each envelope for an added level of customization.